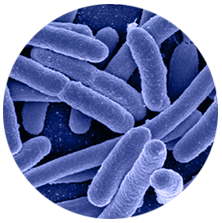 PuraTHRIVE™ Probiotic is carefully crafted using the most studied and effective strain of probiotic bacteria out there, L. Rhamnosus. We also utilize lactoferrin, which is an iron-binding protein found in milk. Its unique affinity to iron allows it to bind closely to the nutrient. So many probiotic products out there are just a combination of “good” bacteria that may or may not even be compatible together. Plus, bacteria are sort of fragile, and can easily be killed off in the manufacturing or packaging processes. Too many people are spending their money on probiotics that they hope will improve their health, and aren’t getting a product that will actually do them any good. We don’t want to see this happen to you! Our PuraTHRIVE Probiotic uses L. Rhamnosus, a well studied bacteria that has been proven to be beneficial for your gut and immune health, development, mental health and more. But we didn’t stop there, we bind it with lactoferrin to ensure the survival of the probiotic bacteria and add to the benefit of using it, and a special RcME delivery technology to supercharge the bioavailability of the product. You can be sure that this probiotic is going to be worth your investment, because your body will be able to put it to use right away, helping to balance your gut biome and improve your overall health. A 2012 animal study showed that supplementation with Rhamnosus improved intestinal permeability post-alcohol consumption. Increased permeability of the gut lining (so called ‘leaky gut’) is thought to be an underlying factor in IBS and potentially even certain autoimmune conditions.A 2014 study demonstrated that Rhamnosus could be an effective option for diarrhea and infections.The researchers concluded: “Given its excellent intestinal mucus adherence capacities, LGG has often been selected as candidate probiotic for the prevention and treatment of gastrointestinal infections and diarrhea”. In a hospital setting, the immune system is often placed under a high amount of stress, and the risk of developing an infection can sometimes be high. A 2010 study suggests Rhamnosus may have immune boosting properties, concluding that it “was efficient in reducing the risk on respiratory tract infections”. A 2011 animal study suggests Rhamnosus can positively influence the brain. Mice fed Rhamnosus had less anxiety & levels of stress hormones than the placebo. A 2015 study suggested early Rhamnosus intake may reduce risks of developing neuropsychiatric conditions. After supplementation in the first 6 months of their life, 13 years later, the Rhamnosus group had NO instances of Asperger’s or ADHD, compared to 17.1% of the control group. The human gut is a notoriously hostile environment, and often destroys probiotic strains before they can be absorbed. Lactoferrin combined with RECEPTOR CELL MEDIATED ENDOCYTOSIS surrounds the Rhamnosus with healthy lipid-bilayers, protecting it from the absorption barriers in the gut, and keeping it safe and sound. This is the most studied form of probiotic out there, with studies indicating that it can help to support gut health and immune system function, assist with child development, encourage and support healthy weight loss and so much more. It’s proven safe and effective, making it the best choice for a probiotic. Lactoferrin can help to balance your overall gut flora and keep the ‘bad’ bacteria at bay. When taken together, Lactoferrin and Probiotics provide a SYNERGISTIC EFFECT, meaning that the whole is greater than the sum of its parts. Some benefits to this combination include enhanced efficacy of antibiotics, extra support for the gut lining and improved immune system support. Medium-Chain Fatty Acids are a nutritious form of saturated fat – often missing from the “Standard Western Diet”. They provide an instant source of energy and they can help with the absorption of other nutrients. – What are the main benefits of PuraTHRIVE Probiotic? – What makes our probiotic better than conventional ones? PuraTHRIVE’s Liposomal Probiotic stands apart from others in four major ways. First, conventional probiotics often contain a range of probiotic strains which can compete with each other in the gut, limiting their effectiveness.We use a very specific, highly potent, targeted bacterial strain backed with a lot of scientific research. Second, conventional probiotics are often low strength, not enough to get an effective response, whereas we use a high-strength strain, combined with a unique, protective delivery mechanism. As for the science, some bacterial strains are well studied, but there are strains used in some conventional probiotic blends without a deep body of scientific evidence supporting their efficacy. Rhamnosus is well tested & safe. Lastly, probiotics are delicate live bacteria – they can die during high heat processing, during the packaging process, transport or on the shelves of the store. PuraTHRIVE Liposomal Probiotic is Protected by the Lactoferrin Bond, so you can be assured you’ll get all the benefits! Our Patented RcME technology shields the probiotic from the harsh environment found in the gut. This means you get less waste, higher bioavailability, and more for your money. – What is Lactoferrin Bond/RcME Delivery? Lactoferrin is an iron-binding protein found in milk. Its unique affinity to iron allows it to bind closely to the nutrient. Aside from that, it’s also an antimicrobial, anti-pathogen and anti-bacterial compound that improves survival rates of probiotics. Our unique RcME Delivery Technology takes the power of Lactoferrin to SUPERCHARGE the bioavailability of your probiotics! – How Does RcME Delivery Work? Firstly, a protective emulsion is produced by conjugating Lactoferrin to Rhamnosus under high pH conditions. It’s homogenized with an excipient, oil and emulsifier under low pressure and mild heat, then cooled to form a small, protective particle containing the Lactoferrin-Rhamnosus combo. By binding Rhamnosus to Lactoferrin, the probiotic becomes much more stable. Now shielded from harsh stomach acids, the Lactoferrin-Rhamnosus combination safely passes through the gut and eventually rests on the gut lining. Here, the protective bi-layers slowly begin to peel away, and the beneficial probiotic and lactoferrin are enveloped directly into the gut lining. The Result? Rhamnosus & Lactoferrin are delivered safely to the gut microbiome – exactly where they are needed most! 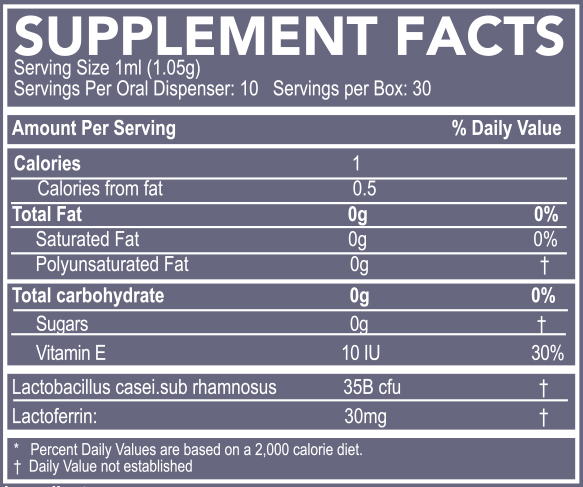 – What is the recommended dosage? Each day you should take 1ml from the syringe, as indicated on the site of the packaging, then re-cap the product and keep it refrigerated. – Can you take more than the recommended dosage? You certainly could, especially if you feel as though your gut health needs a boost, or you potentially have more bad gut bacteria than good. 2 ml a day is the maximum dosage for this kind of use. Keep in mind that if you have a sensitive stomach, or you start to notice you’re reacting strongly to a larger dose (diarrhea or tummy upsets could occur if this is the case) that you should reduce your dosage. Staying on the product consistently will help you to improve your gut health over time. – How long does one package last? One package contains enough product for one person for 30 days if you take the recommended dosage of 1 ml per day. This supplement should be taken once daily. As with most probiotics, it is best to take this one 30 minutes before a meal. It’s also ideal to take it at the same time every day, to help you form a habit of using it. Our Liposomal Turmeric formula is crafted inside an FDA Certified, GMP compliant lab in the USA. Our product has been tested and is Heavy Metal Free / Prop 65 Compliant, Gluten Free and Non-GMO.